Call Music Mania Events at 407-792-4631 in Orlando, Florida for DJ entertainment packages, Photo Booths, Lighting, Trivia, Karaoke and Video presentations for weddings, birthday parties or any event that needs an experienced party service company. 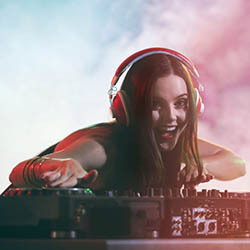 Our Interactive DJs and fun party packages make your party the one everyone remembers! Imagine walking into your event with soft Up Lights glowing on every wall in your favorite color, your name in lights - larger than life- with our monogram light, colorful dance lights pulsating to the beat with mystical fog making them shine even brighter.... grab a boa and some oversized sunglasses to pose at the photo booth, have fun with other guests playing trivia on the screen, and request your favorite songs. Karaoke is an entertaining option for less formal events. If you're wondering about the cost to get such an amazing party, you'll be happy to know we have affordable rates and party packages for every budget! If you're looking for an interactive DJ with affordable rates, call or text us at 407-792-4631, or fill out either the Wedding Quote or Party Quote form. We provide entertainment for Weddings, Birthday Parties for kids, teens and adults, Sweet 16, Quinceañera, Mitzvahs, Graduations, Corporate Events, Schools, Community Events and any party! Get your Wedding Quote or Party Quote here! If you're in the Orlando Florida area - from Daytona Beach to Davenport - call (407) 792-4631Music Mania Events for DJ entertainment and party services for weddings, birthdays, corporate and all types of parties! Call Music Mania Events at 407-995-6415 in Central Florida for DJ entertainment, weddings, or party services.